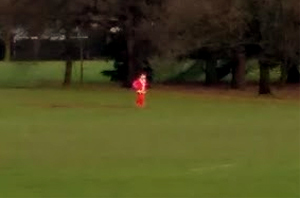 Spotted in Horsham Park Christmas Eve morning, apparently taking time out from his busy schedule to enjoy a stroll in the unseasonably mild December weather. I hope he got back to work soon, though, I’m expecting my gifts under the tree this morning, and I’m not taking “It was too nice to think about working” as an excuse. In other news, there isn’t much news; hence the silence. But I thought I’d leave you all with a little Christmas gift, a video of 10-year-old Kayleigh Rogers, from a Special Needs school in County Down, singing a version of Leonard Cohen’s Hallelujah. Have a Happy Christmas. Over eat, play with your toys until they break, cry, laugh and, most of all, enjoy each other.